A few weeks ago, I had the pleasure of appearing on WRFL’s show “Bedroom Productions” with host Robbie Gay. Throughout the 1-hour show we discussed composing music for film and games, the processes involved with those, as well as recording, production, new projects, old projects, and everything in between. Features music from mobile games Bread Kittens/Puppies and Nomasaurus Rex (Bake 450), the PC game Star Trek Alien Domain: Incursion (Game Samba, CBS Interactive), and my band Home Grown Head. As of last week, Remnant 13​ is fully scored! All-in-all about 45 minutes worth of original cues were composed for the series. This is the largest volume of music I have composed for a single project so far! A special thanks goes out to director William David Glenn IV​, who provided excellent musical direction on this – he had a precise vision of what he wanted to portray and knew exactly how to spell it out. And producer Shawn Lindsey​, for providing me with this opportunity and being the glue keeping this whole thing together. Thank you!! Remnant 13 is currently in it’s final phase of editing and soon to be in distribution, so keep your eyes peeled for some exciting news! finally begun this week, as post production on the sequel nears an end. All-in-all, about 20 cues of varying lengths will be composed over the next few weeks. Some cues will be based on pieces composed early on in the process, such as “Pillar of Strength”, whereas others will be new compositions. “Pillar of Strength” is a character theme for Katia, who is a constant source of fierce strength and support for our hero, Arden. While Katia does not possess the magic powers that Arden does, she uses her fearlessness and mental prowess to take on her foes. The piece is bookended with a flowing oboe and string melody which takes on a feminine but strong quality. Horns and percussion take over to represent that strength, wit, and no-BS attitude that makes her a success on the battlefield. The rest of score contains a wide gamut of styles and moods; from the pure demonic sounds of “Presence Of Evil” to the romantic mood of “By Moonlight”. To hear them all, you’ll just have to check it out for yourself! Once post production comes to a close, the film will be available on Amazon Prime, among other distributors. So keep your eyes peeled and your ears open! Filming is taking place through the end of the year, and is set to release in 2018. Keep your eyes (and ears) peeled for more! Recently I created a Frequently Asked Questions page to my website and as part of that, I wanted to take some time to describe the process of scoring a film. It is very much a behind-the-scenes part of film making, so hopefully I can provide some insight into my side of things. The world of composing for film is a very individualized process – each composer develops their own process for not only writing, but all the other details, organizational structure, timing, production, and so on. The process for me, and the process I used for The Cure, is a 4-part process, which spans everything from the initial study of the video, composition, production, up to delivering the finished product. Here I will outline the process that I typically use, and how I went about creating the score for The Cure. So let’s get to it! The word research has a bad connotation for some, as it makes you imagine studying into the wee hours of the morning like you may (or may not) have done in school… well… that’s actually still true. But in this case, research means watching a movie, taking some notes, and knowing that ultimately you will be responsible for all or most of the music in the film, which actually makes research pretty fun and interesting. With The Cure, it also meant listening to some of the great film scores/soundtracks from some of the best modern horror films; everything from Dawn of the Dead to its much less serious cousin, Shaun of the Dead. After some horrific inspiration, you’re in the right state of mind to get to work! 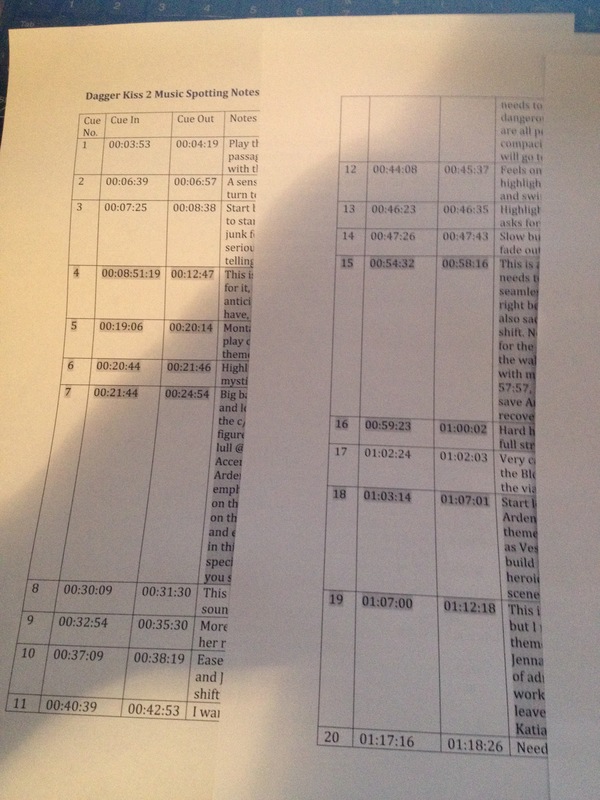 It is fairly typical that the director will send a cue sheet, as was done for The Cure, which contains some basic information on where music should begin and end for each cue (segment of music). The cue sheet also contains some information about each cue and/or references to other music that is similar in style to their vision. After viewing the film in its entirety, I begin taking notes within the cue sections the director has assigned. Sometimes the notes may be simple, such as “Big hit here” if I don’t have a complete idea yet, but know I’ll need something for a certain event (event, in this case, meaning moments which are highlighted with a musical device). In other cases it may be more complex, like “Slowly building viola/cello tremolo for 3.5 seconds, add in cymbal roll + string bass, building up to horn rip to Major I and pianissimo violins on iii chord diminuendo up to next event.” It really just depends on the situation and how I’m mentally processing the video at the moment. Some scenes are typically easy to write to: panning landscapes, setting scenes, elongated quiet background music used during dialogue… and I only say they are easy because it frees the composer to just write really great music without having to consider much in the way of timing it to the picture. Then you have action scenes (which most of The Cure scoring was), chase scenes, fighting scenes, or anything that has several events only seconds apart that need to be scored to – these can be much more difficult, but can often times be the most fun to write and interesting to hear. 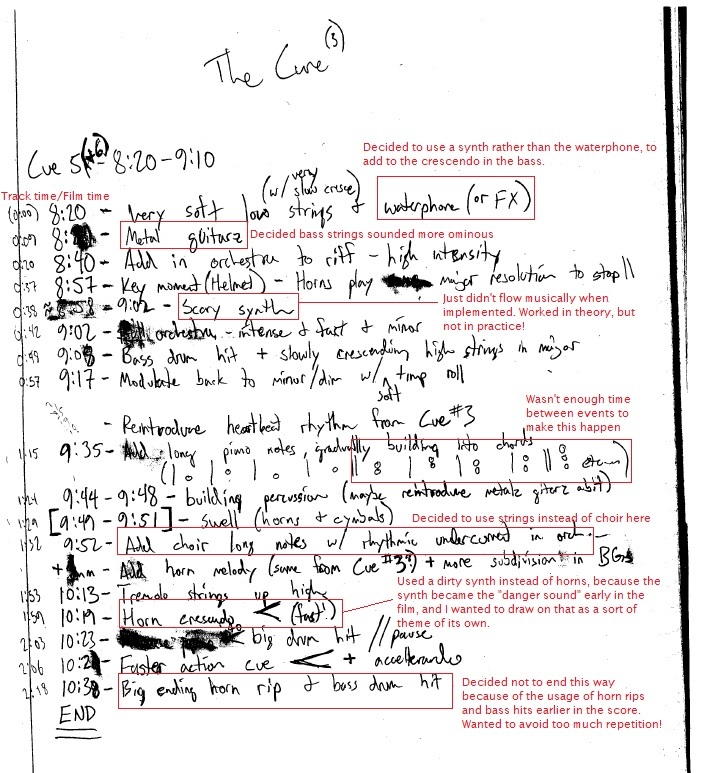 If you check out some of my notes on the final cue, “The Reveal”, and compare them to the audio here, you will notice only about half of the initial ideas actually make it through to the final version, due to one reason or another, usually because the initial ideas are too dense, or there’s simply too much going on already in the film to be useful, or it just doesn’t make sense with the other music happening around it. Despite what actually occurs at the time markers, something always happens at each event listed, and it must fit the mood of the situation on screen. Without a reaction to each event, the director may as well have just bought a track off of their favorite music licensing site, and that’s where the composer really gets to make a difference! It may be as subtle as a pianissimo flute flourish, or it may be as brash as a fortissimo gong hit, but it’s up to the composer to decide ultimately what happens at each event. Once I have an outline, and have compiled a few ideas, I begin the actual writing. 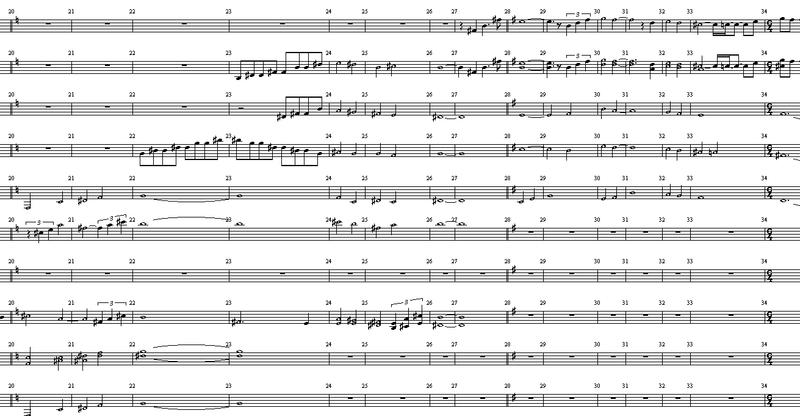 I prefer to compose in notation software, so that I can actually organize the music on the page. It also allows me to set up an accurate timeline for how each cue in the video will translate to the music. You can see on this section of the score how an event (in this case the drop of the first helmet) is timed within the score. The first step in this process is to figure out appropriate timing between events. So, I tend to start with just a metronome click, and as I am thinking up very basic ideas I can organize the tempo, tempo changes, and time signature to match the event timing. 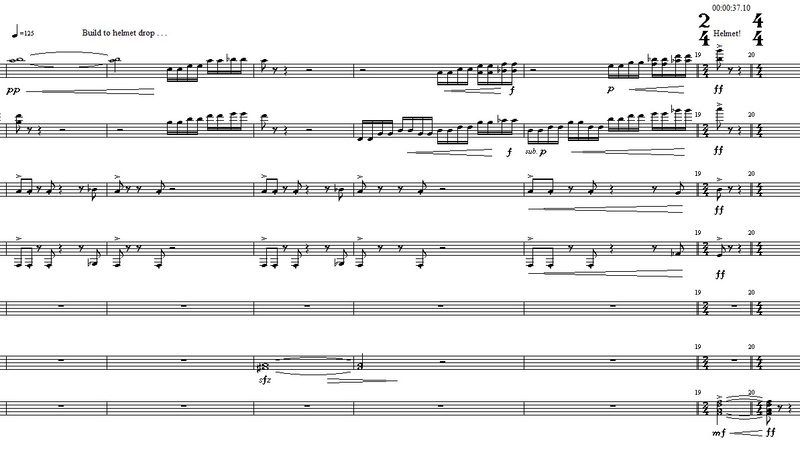 For action scenes specifically, I like to start writing a bit of percussion first, as it allows me to hear the timing between events in a more musical way than the metronome, and it provides a foundation for creating melodies on top of it. The percussion track usually goes through several different versions once I start actually composing melodies – if the percussive rhythms don’t match the melodic rhythms in some way, it will just sound like clutter. After the basic percussion part is solidified and the melodies are in place, I can finally begin fine-tuning everything. At this point, we still only have a very basic track with some percussion and a handful of melodic material. So I may add a counter-melody, harmonic line, or some effects than emphasize something the melody is doing. Again, this process goes through several iterations until everything starts sounding like it does in my head. From then on, it’s testing timing until it’s just right, and ensuring that nothing I wrote will cover up something important in the film, such as dialogue. Of course, the editor can adjust the music to fit in the final step, but nobody wants to write a big orchestral melody only to have it covered up by gunshots, squealing tires, or screams! This is where things get really hairy! Not many filmmakers can afford to hire a 60+ piece orchestra, so that means using technology to achieve the sound we really want. After everything is written, I can transfer the MIDI information into whichever DAW (Digital Audio Workstation)is most appropriate for the job at hand. At this point, I begin plugging in VSTs (Virtual Studio Technology – or Virtual Instruments) from my VST libraries into each track. However, it’s not quite as simple as just plugging them in. Each track is divided into specific attacks, short notes, long notes, certain effects, tremolos, trills, appropriate reverb for each instrument, etc… The synths also need to be tested and dialed in to achieve the right sound for the task at hand, which may mean altering pitch, velocity, phasing, rhythm, modulations, and equalization. Without all the fine tuning, the piece will sound only slightly better than the MIDI we started with. Eventually, with enough work, it starts to sound somewhat like it does in my head. Recording parts and editing virtual instruments. Once the entire composition/production process is complete, I then send the director the completed files for review. Communication is very important between the composer and the director along each step, so that both are on the same page. Luckily for me, Nick was always willing and able to discuss certain ideas, present changes, and speak in the type of language that we can both relate to, and do so quickly and efficiently despite us being on opposite ends of the world! Eventually the light begins to appear at the end of the tunnel and alterations can be made to suit the director’s vision, and ensure that the timing is accurate for the final version of the film. Finally, the film editor or sound engineer may adjust volume of the audio during the final editing process to make sure that all important dialogue or SFX are heard. After that, for me, it’s usually waiting anxiously for the final OK, and then… my job is done! Beyond that, all that’s left is to pop some popcorn and watch the film! Scoring film is not exactly an easy task; it takes a tremendous amount of patience at times. However, each time I get to hear my music working alongside a film, it’s a great feeling and the whole process becomes worth its while. It is something I hope I can continue doing for the rest of my life, so I love and appreciate having the opportunity to work on awesome films like The Cure. Thanks again to Nick for letting me share my process with you all, and I look forward to sharing more music with you, through more of his films in the future! If anyone out there has questions/comments/complaints/requests for me, please feel free to contact me directly at will.phill.music@gmail.com. I’m happy to announce that I’ll be scoring a new film from November 11th Pictures, entitled How Envy & Jealousy Killed Love. The score is one I’m really looking forward to, as it will incorporate an interesting mixture of instruments and styles. It could be described as cinematic soul… a combination of soulful horn and guitar melodies, a live rhythm section, cinematic strings, and other orchestral elements. All these will work together to create a soundscape that brings out the 70’s themed environment with a deep, cinematic sound of the orchestra. Shooting is scheduled towards the end of March. The film, written and directed by Lilton Stewart III, is currently in the pre-production stages with plans to wrap everything up in the Spring. Some preliminary plans for the film include several showings across the country, both independently and as part of the film festival circuit.